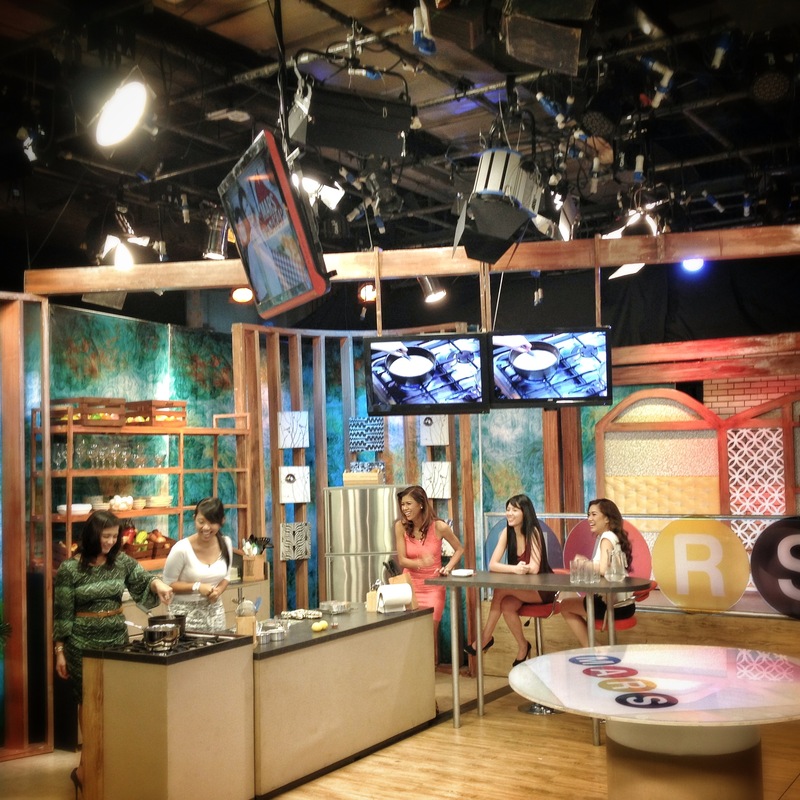 Last week, I journeyed from my southern end of Metro Manila to the far north to share my vegan leche flan recipe on the Mars show on GMA News TV. While my spoken Tagalog was slightly atrocious, I believe the flans saved the day. I initially created a vegan leche flan for my column at Yummy Magazine last December. 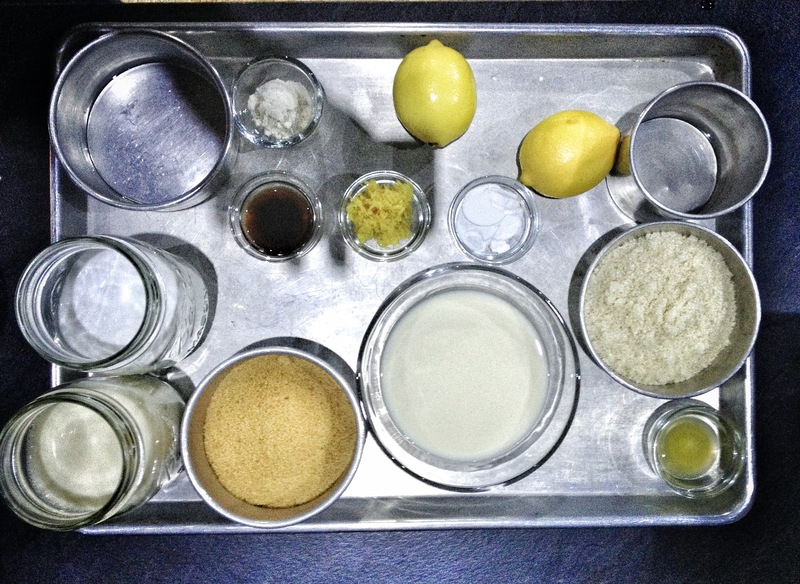 If you missed the recipe, it’s posted online here. What makes this flan different from the other flans? It’s a no bake flan – no oven required! Just a stove. I’ve been meaning to tinker around with the original recipe, streamline the cooking steps and decrease the cane sugar content. Prepping for this show gave me the perfect excuse to do so. 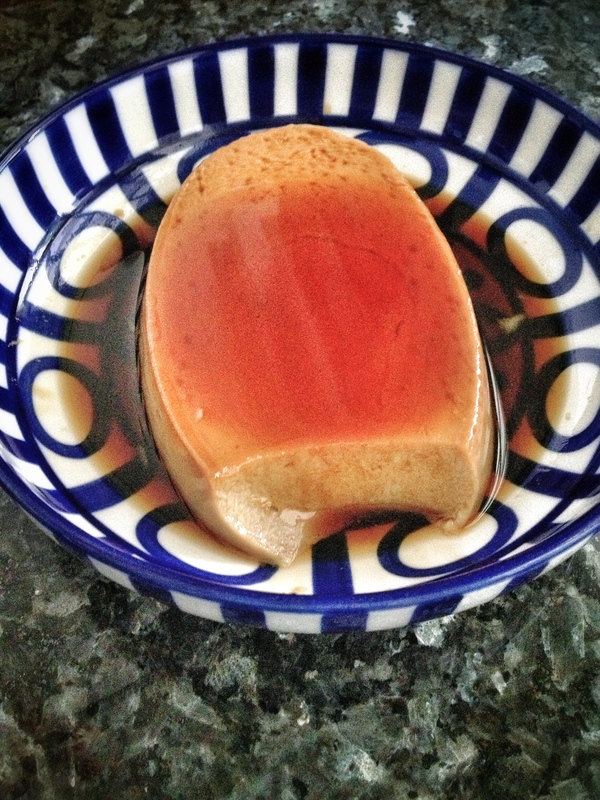 So without further ado, here is my super easy, no-bake leche flan. Dairy-free, egg-free, cholesterol-free, gluten-free, possibly refined-sugar free. Give it a try and if you make any improvements on it – post a comment below. December is by far my favorite month of the year and it has everything to do how we Filipinos celebrate the holidays: the reunions, the get-togethers, the gift-giving, the glorious food! One of the most ubiquitous Christmas foods that happens to be a personal favorite is leche flan. If you’re like me, you claim that your lola’s flan is by far the richest and that the recipe is a closely-guarded family secret. I fondly remember Christmas lunches at my grandparents’ house and ending the feast with spoonfuls of luscious, golden leche flan. Yes, my lola’s leche flan was the stuff of legend and unfortunately, the stuff our arteries and hearts did not enjoy. Food is so much a part of social gatherings but we forget that it also plays an integral role in our health. Instead of making healthy food a remedy to our mistakes, let it become part of our daily routine and our festivities. This month, I invite you to be the change and celebrate healthy eating everyday. Here is my version of leche flan, still as creamy and flavorful as its infamous forefather without the cholesterol, white sugar, and excess fat. Try it out and don’t forget to eat to live – not the other way around. Happy Christmas! 1. Prepare the flan molds – llaneras, ramekins, dessert bowls, etc. Because this flan is no-bake, you can use any heatproof food-grade dish. Place them on a wire rack or pot holder. 2. In a small saucepan or frying pan, combine the sugar, water, and lemon juice. Bring to a boil over medium heat and cook without stirring for 5 to 10, until the caramel reaches a deep amber color and the soft ball stage. To test, drop a bit of the mixture into a glass of cold water. If you can form a soft, flexible ball of caramel with your fingers, it’s ready. 3. Quickly pour a thin layer of caramel into the bottoms of the molds. Tilt each mold with a circular motion so the bottom is completely coated in caramel. Set aside and make the flan. 1. In a saucepan, add the1 1/2 cups soy milk, coconut milk, sugar, and water. Sprinkle in the gulaman and whisk quickly to dissolve. Add the lemon zest and bring to a boil over medium heat. 2. 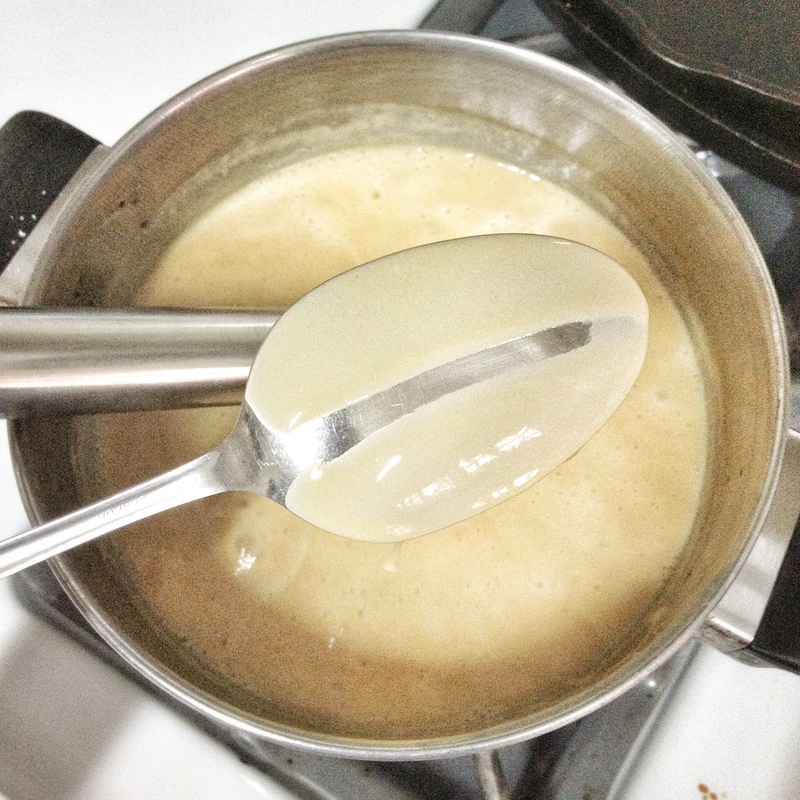 Lower the heat and whisk in the starch-soy milk mixture. Cook and stir constantly until the mixture has slightly thickened and cornstarch is completely cooked (it should be smooth, not chalky), about 5 to 7 minutes. Remove from heat and stir in the vanilla. You’ve got the right consistency if you dip a spoon into the flan mixture, run your finger through the back of the spoon and the mixture doesn’t run. 3. Pour the flan into the caramel-lined molds, leaving about ½-inch from the top of the molds. Let cool to room temperature; move to the refrigerator to completely firm up for a few hours and up to overnight. 4. 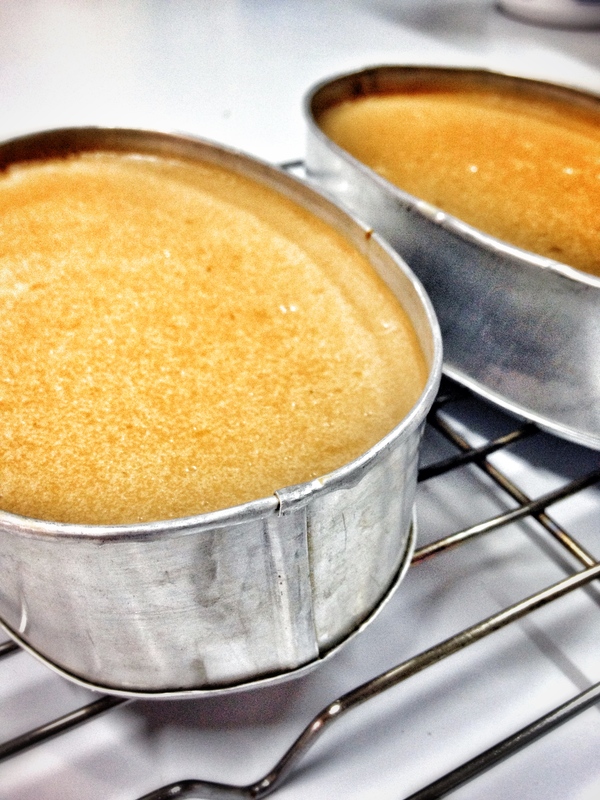 To serve, gently run a knife along the sides of each flan. Invert the mold onto a serving plate; the flan should slide right off. Congrats with the feature! 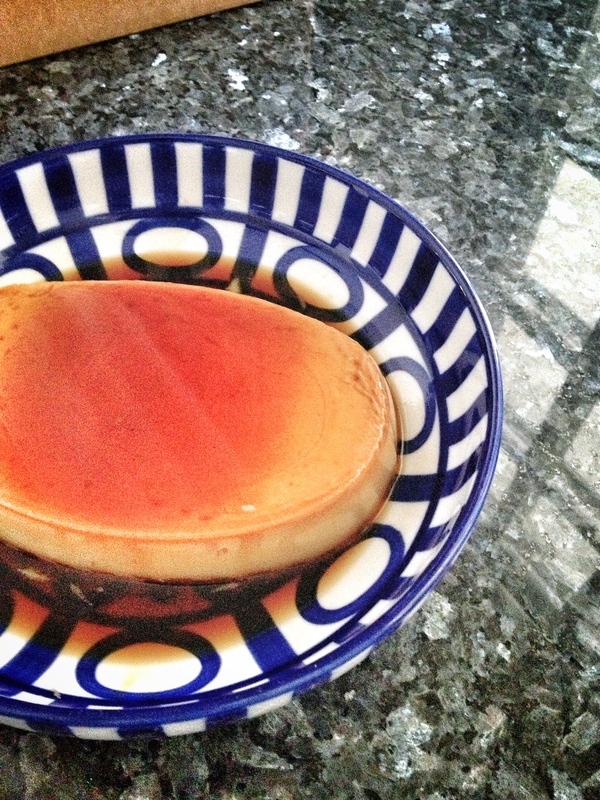 Thanks for sharing this awesome vegan leche flan! Can I use soy milk all the way and skip coconut milk? Opposite question: Can I use all coconut milk? Hoping to make this for someone who is allergic to both soy and almonds. Can I use gelatine instead of gulaman and can I incorporate vegetable? Hi Licemer I wouldn’t recommend using gelatine because it is made from animal bones. Vegetables would not go with this dessert. I’m confused i thought gelatine and gulaman are the same. what do you mean by gulaman? would you recommend a brand? hi marie, about the starch is this in powder form? and where do you buy yours? Yes, you can use corn, potato, or cassava starch. I usually use cassava and I get it from a supplier in bulk. You can purchase starches in supermarkets in the baking section. I used Knox gelatine since we can’t use agar due to allergies. Turned out wonderfully! Thanks! wonderful! since that i had an allergy to eggs this recipe is just perfect! thank you. Where can i buy agar agar powder? Supermarkets carry gulaman / agar. Can I use Almond Milk in olace of soy milk?